Conceptual Physics 12 Edition Note: You are purchasing a standalone product; MasteringPhysics does not come packaged with this content. If you would like to purchase both the physical text and MasteringPhysics search for 0321908600 / 9780321908605. That package includes ISBN-10: 0321909100 / 9780321909107 and ISBN-10:032190978X / 9780321909787. MasteringPhysicsis not a self-paced technology and should only be purchased when required by an instructor. 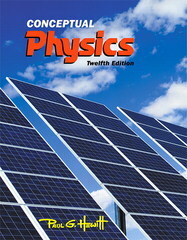 Conceptual Physics with MasteringPhysics® , Twelfth Edition Paul Hewitt integrates a compelling text and the most advanced media to make physics interesting, understandable, and relevant for non-science majors. The Twelfth Edition will delight you with informative and fun Hewitt-Drew-It screencasts, updated content, applications, and new learning activities in MasteringPhysics. Hewitt’s text is guided by the principle of "concepts before calculations" is famous for engaging students with analogies and imagery from the real-world that build a strong conceptual understanding of physical principles ranging from classical mechanics to modern physics. This program presents a better teaching and learning experience–for you. Personalize learning with MasteringPhysics: MasteringPhysics provides you with engaging experiences that coach you through physics with specific wrong-answer feedback, hints, and a huge variety of educationally effective content. Prepare for lecture: NEW! 100 Hewitt-Drew-It screencasts, authored and narrated by Paul Hewitt, explain physics concepts through animation and narration. The exciting new Screencasts, accessed through QR codes in the textbook, will enable you to engage with the physics concepts more actively outside of class. Make physics delightful: Relevant and accessible narrative, analogies from real-world situations, and simple representations of the underlying mathematical relationships make physics more appealing. Build a strong conceptual understanding of physics: You will gain a solid understanding of physics through practice and problem solving in the book and in MasteringPhysics.